The very first question for many people, regarding fasting is whether it is good or bad for your health. The answer to this requires a quick overview of what happens inside the body during fasting: the physiology of fasting. The changes that occur in the body in response to fasting depend on the length of the continuous fast. Technically the body enters into a fasting state eight hours or so after the last meal, when the gut finishes absorption of nutrients from the food. 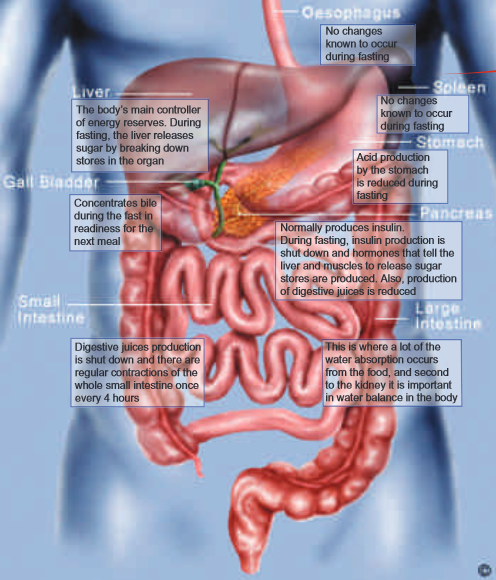 In the normal state, body glucose, which is stored in the liver and muscles, is the body’s main source of energy. During a fast, this store of glucose is used up first to provide energy. Later in the fast, once the stores of glucose run out, fat becomes the next store source of energy for the body. Small quantities of glucose are also ‘manufactured’ through other mechanisms in the liver. Only with a prolonged fast of many days to weeks does the body eventually turn to protein for energy. This is the technical description of what is commonly known as ‘starvation’, and it is clearly unhealthy. It involves protein being released from the breakdown of muscle, which is why people who starve look emaciated and become very weak. As the Ramadan fast only extends from dawn till dusk, there is ample opportunity to replenish energy stores at pre-dawn and dusk meals. This provides a progressive, gentle transition from using glucose to fat as the main source of energy, and prevents the breakdown of muscle for protein. The use of fat for energy aids weight loss, preserving the muscles, and in the long run reduces your cholesterol levels. In addition, weight loss results in better control of diabetes and reduces blood pressure. A detoxification process also seems to occur, as any toxins stored in the body’s fat are dissolved and removed from the body. After a few days of the fast, higher levels of certain hormones appear in the blood (endorphins), resulting in a better level of alertness and an overall feeling of general mental well-being. Balanced food and fluid intake is important between fasts. The kidney is very efficient at maintaining the body’s water and salts, such as sodium and potassium. However, these can be lost through sweating. To prevent muscle breakdown, meals must contain adequate levels of ‘energy food’, such as carbohydrates and some fat. Hence, a balanced diet with adequate quantities of nutrients, salts and water is vital.